If you didn't read our last post ... we're moving! Yep, we sold our house and signed a one year lease for a condo. Why not move straight onto Nirvana? If you've been following along for a while, you know that things have been tight for us the past few years. 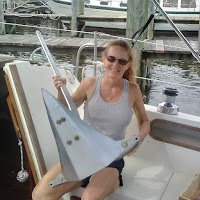 Our finances, our time and our energy have been limited ... meaning we weren't able to work on our sailboat. During the next year Ken's going to upgrade the electrical, plumbing and other things on Nirvana. Living together on a 30 ft. boat while tackling those projects wouldn't be pleasant. We want our life on board to start on a positive note, not with us wanting to kill each other! Plus, even though our monthly rent won't be as cheap as a marina we're still going to be reducing our bills. Moving from a 2200+ sq. ft. home to a two-bedroom condo under 1300 sq ft. (more about our new place soon) in two weeks is no small task, especially when one of us is in the construction business and can't quit work just yet. Minimizing our household items hasn't been too bad so far. Leaving behind the refrigerator, washer, dryer, and some other furnishings for the new owner makes moving a little easier. A garage sale was contemplated, but time is money so we ditched the idea. We donated things that the new owner wouldn't want to Goodwill. Most of the items were small knick-knacks and not worth much. It was a good feeling to just be rid of all the crap. We've been sorting through our closets, cabinets & attic and left a big pile at the curb for the garbage collector. Our recently married daughter spent this past Sunday emptying out her room ... another truckload to Goodwill. Sentimental items like photos and stuff are coming with us to the new condo. We have a year to figure out which lucky family member gets to keep these things for us when we're sailing. We've kept a few things to sell on Craigslist after the move, mainly motorcycle stuff ... a seat, windshield, saddle-bags, and helmets. Hopefully we'll get a little more for them than if we'd sold them at a garage sale. We've also got two motorcycles (yep, I have my own) to sell, but until we get them running (the costs of letting them sit too long) we're keeping them at my dad's place. Things like china & crystal from our wedding will be pawned off on our daughter ... we hope. It seems nobody uses that stuff these days, I know we didn't. We're not done yet ... Ken's still tackling the biggest project, the garage! Some folks use their garage for parking their cars ... we use ours to cram full of tools. If it weren't for Ken's construction business, downsizing would be much easier. 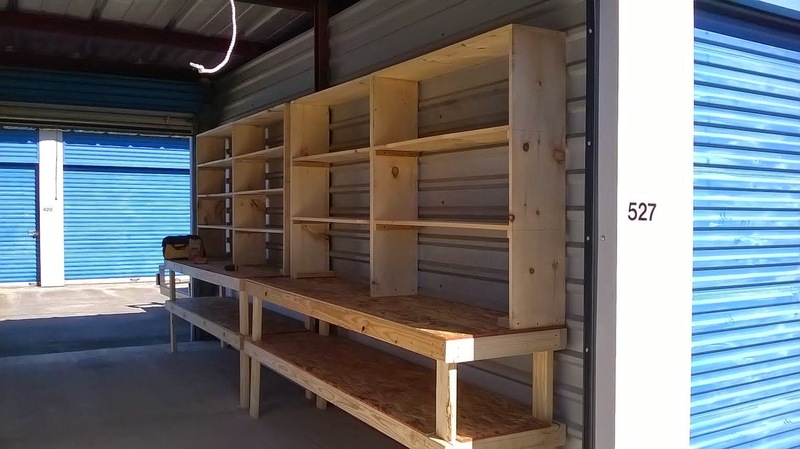 Ken's gonna keep working while upgrading the boat this year, so he rented a storage shed and built some shelves to put in it to keep things organized. The condo has a two-car garage, but it's really a glorified carport so it's not gonna do the job. He whipped up these shelves before noon! These shelves will make storage easier, but it's still tough. We'd already been renting a small storage shed for Ken's business the past few years, and now he's consolidating the contents of our garage and the smaller storage shed into one place. Ken's been steadily working on going through all of his tools and organizing everything ... that in itself is a major accomplishment. Ken will admit that neither the garage or the storage shed was organized. This is a good time to start the next year off right. We've got a lot of use for those tools on Nirvana. We've got a lot to do before Halloween ... just one more week before we have to be out of our house. All of this is kinda surreal ... I guess because we sold our house but went back home. We didn't turn over any keys, and we're still living in the same place. I'm sure reality will hit soon .. I just hope that we don't miss our waterfront views too much. Our hopes of renting a waterfront place didn't work out ... too expensive. We just have to remind ourselves that living away from the water is only temporary. Tonight we get the keys to the condo and start moving! You'll make it work. I can tell you'll make it work. 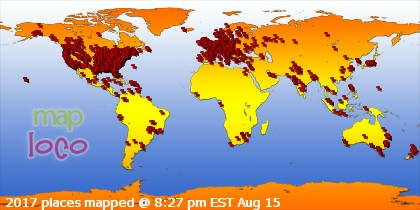 I can only imagine how busy you are! The shelves and tables are great -- it's wonderful to be married to someone so handy, no? I can't wait to hear/see more about the condo and hope the final move/transition goes as smoothly as possible! We are so happy for you guys! Hope y'all get settled in to the new place quickly so you can begin the next phase of your adventure! 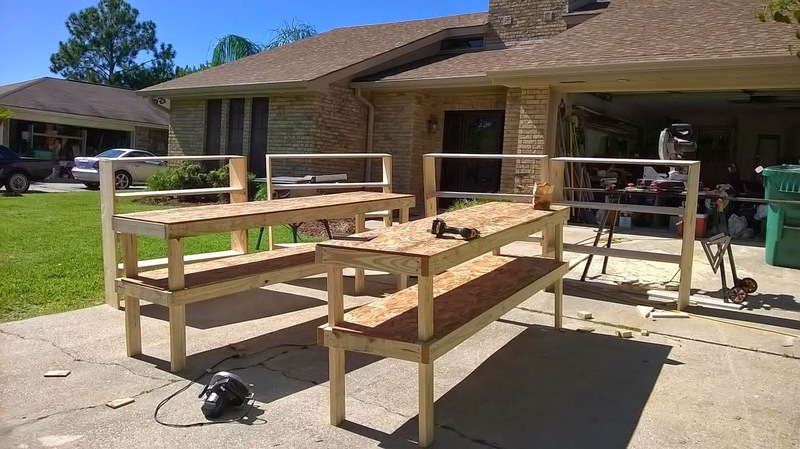 Ken did a beautiful job on those shelves and workbenches-what a great skill to have! I'm so happy for you! Your man is really handy , he did a great job! I'm glad I found your blog!